Spinach wasn't a vegetable I always liked, especially as a kid. I refused to eat it no matter how convincing my mom might have been. And the Popeye cartoons didn't help change my mind either. As an adult, though, I love spinach. I'm not the biggest fan of it creamed, which is how my mom made it, but I love it sauteed for a side dish or used in main dishes. But have you ever thought of using spinach in a stir-fry? Many years ago I had the wonderful opportunity of trying a Korean stir-fry for the first time. 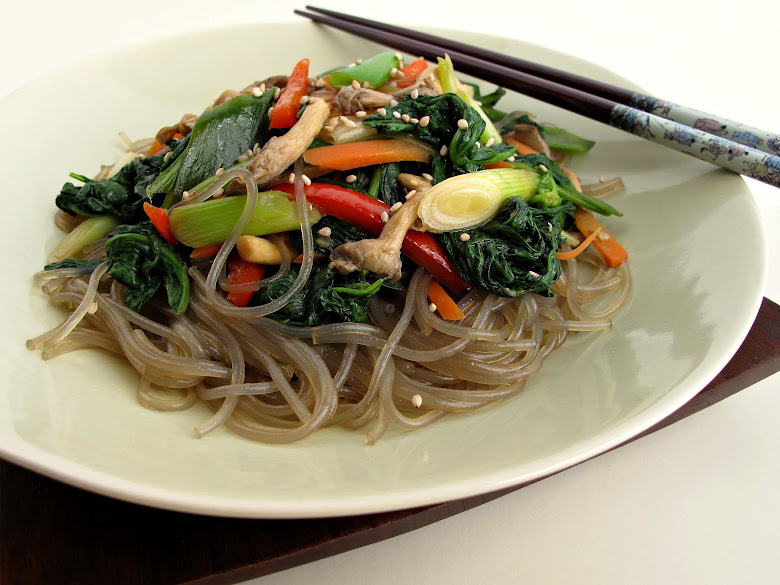 The dish I had was Japchae, which features spinach and glass noodles (made from potato starch) that look exactly as you would imagine. In Korea it's traditionally served as a side dish, but restaurants typically make a main course out if it by adding beef, chicken, or tofu to the dish. I like to serve mine as a meatless main. The combination of simple Asian flavors and fresh vegetables makes for a refreshing stir-fry that celebrates spring spinach. Note: Make sure to use regular sesame oil for cooking and toasted sesame oil only as a seasoning. Boil the glass noodles according to package directions, about 6 to 7 minutes. Rinse in many changes of water until chilled. Drain once ready to cook. Heat a wok at medium heat. Add 1 tablespoon sesame oil. Once hot, add garlic and ginger and sauté for 1 minute. Add carrot, bell pepper, and scallions. Sauté for 2 to 3 minutes. Add mushrooms and sauté for 1 to 2 minutes. Add spinach, a handful at a time, and toss until wilted. Season with salt and pepper. Remove vegetables to a bowl and keep warm. Refresh wok with remaining 1 tablespoon sesame oil. Once hot, add cooked noodles and toss until well coated. Add soy sauce and toss until well coated and noodles turn glassy. Return vegetables to wok. Add toasted sesame oil. Toss to rewarm. Check seasoning. Some more soy sauce or sesame oil can be added. Garnish with sesame seeds. Serve immediately. Yield: 4 servings.